With its new coordinate measuring machine, ZEISS XENOS, ZEISS is setting a new standard in precision: featuring length measurement error of just 0.3 micrometers, this measuring machine offers unparalleled accuracy in this class. ZEISS XENOS will be officially introduced at the CONTROL show in Stuttgart, Germany, beginning 6 May 2014. This coordinate measuring machine is used for applications that require maximum accuracy and in reference labs. “All standard measuring machines can only be optimized up to a certain level. Sooner or later, this potential is exhausted,” explains Konrad Werner, ZEISS XENOS Product Manager. This machine is therefore an absolutely new development. ZEISS XENOS stands for accuracy and future proofness thanks to the use of innovative technologies and materials. It offers a measuring range of just about one cubic meter. The engineers at ZEISS took a new approach in the development in order to set a new standard in precision with this measuring volume, while also increasing the measuring speed. Together, the weight reduction and constantly moving masses enable optimal coordination of the drives regarding acceleration and maximum speed. 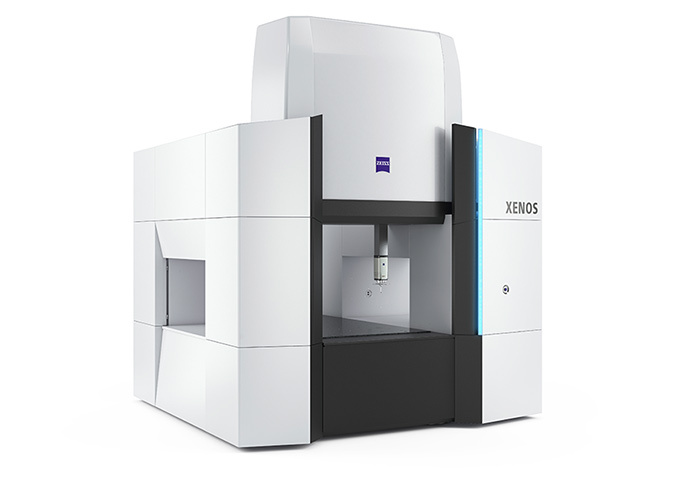 Unlike other systems, the ZEISS XENOS uses linear drives on all axes instead of friction drives. “This provides clear benefits, such as very fast acceleration and generally high speed, as well as high positioning accuracy and shear force-free drives,” says Werner. Thanks to the overall concept, it was possible for the first time to decouple the force transmission of the linear drives of the guideways and measuring system. Taking into account the high-resolution scales on ZEISS XENOS, the new drive technology results in very high path adherence and extremely high positioning accuracy clearly below 100 nanometers. One benefit of the very high path adherence is evident when measuring curved surfaces: “The more reliably and accurately a stylus follows the specified path, the more precisely errors can be determined,” says Werner. For the first time, ZEISS used an innovative silicone-carbide ceramic for the parts of the machine structure relevant to accuracy. Unlike the white standard ceramic, the black silicone-carbide ceramic exhibits around50 percent lower thermal expansion, up to 30 percent higher rigidity and 20 percent less weight. Compared to steel, it delivers twice the rigidity at half the weight.